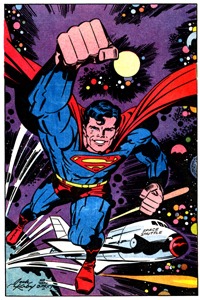 Jack Kirby takes to the Fourth World! "The bottom line involves choices. Neither gods nor humans have ever stood calmly in a minefield forever. Good or evil, they are bound to choose. And when they do, you will see the truth of all that motivates us. As a thinking being, you have the obligation to choose. If the fate of all mankind were in your hands, what would your decision be? "As a writer and an artist, I've drawn my answer."